We all know a rebellious kid back in school who just refused to listen to instructions. Wei Yan is a competent Shu Han 蜀汉 general who was similar to that kid. Though not an outright rebel, Wei Yan always had that streak in him that made him difficult to lead. If there was a phrase that he would say, it would probably go along the lines of "Why should I (bla bla)...". In true dramatic fashion, Wei Yan became the "bad guy" when he revolted against Zhuge Liang 诸葛亮 and Shu Han. In today's world, he would probably make a pretty successful entrepreneur! After you inflict 1 unit of damage to a player within physical distance of 1, you regain 1 unit of health. A vampirical character is fun to have in a game, though there is no mention of any blood-sucking characters in Romance of the Three Kingdoms. Of course, Wei Yan was never a vampire and wasn't even portrayed anywhere near one. So this ability is purely just for gaming sakes. “狂骨” was likely a word made up by game makers. 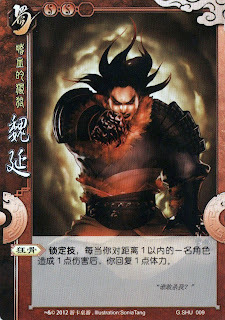 “狂” referred to his arrogance and lack of self control, while “骨” referred to a bone located at the back of his skull, and Zhuge Liang once said the bone was the complexion of a traitor.